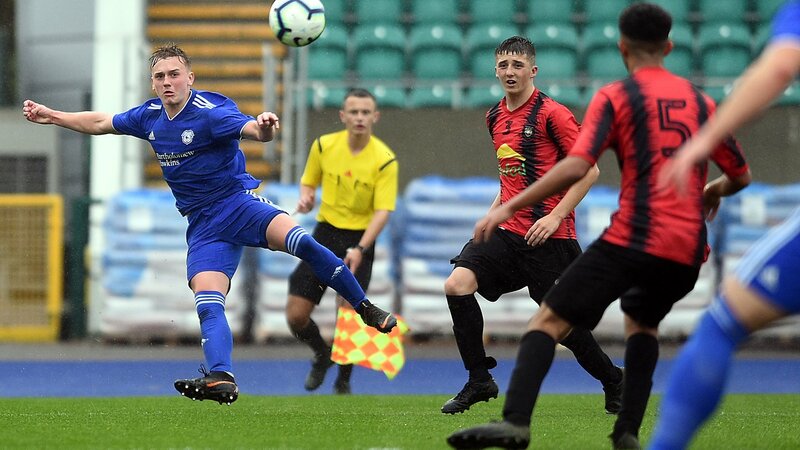 Action from the Cardiff City v Tiger Bay FAW Youth Cup tie. Pic: Cardiff City..
Cardiff City could not stop Ipswich Town extending their unbeaten under-23 run to 11 matches, but the young Bluebirds earned a 2-2 draw in Suffolk. City, jointly managed by Andy Legg and Jarred Harvey, now play Watford in their next Professional Development League fixture on Monday, October 18 (7pm). Town remain unbeaten since a defeat to Sheffield United in August and will look to continue their impressive run when they face Crystal Palace on Tuesday, November 19 (1pm kick-off). It took just a quarter of an hour for Blues to take the lead with Cardiff’s Ciaron Brown deflecting Jack Lankester’s powerful drive into his own net after 14 minutes at Portman Road. Cardiff hit back through goals from Jack Bodenham and Jamie Waite before half-time, but the home team scored a second thelmselves to earn a draw. Man of the match Waite’s free-kick was headed home by Bodenham, while Waite lobbed goalkeeper Harry Wright to put Cardiff in front. Ben Folami netted the second Ipswich goal, netting after Kai Brown’s effort rebounded off a post. Jarred Harvey chats to Bluebirds’ under-23 players. Pic: Cardiff City. Goalkeeper Matthew Hall made some good saves for City, while they produced a solid overall away display to earn a creditable draw. Chances were harder to come by after the restart, but Folami made no mistake in the 70th minute when he turned the ball in after an initial shot struck a post. Both sides had opportunities to win in the latter stages with Cardiff substitute Lloyd Humphries striking a post from distance before Shane McLoughlin blazed over for Blues. Legg and Harvey made five changes to their starting line-up and they included a recall for Jamie Veale. Ipswich Town: Wright, Cotter, Clements (Ndaba 80), Nsiala, C Smith, McLoughlin (capt), Bishop (McGavin 46), El Mizouni, Lankester, Folami, K Brown. Subs not used: Egan, Marshall, Ndaba, Dobra. Cardiff City: Matthew Hall, Paul McKay (Pryce 72), Cameron Coxe, Tyrone Duffus, Ciaron Brown, Jac Bodenham, Laurence Wootton, Jami Veale, Babatomiwo (Lloyd Humphries 51), James Waite, Jake Evans. Subs not used: Warren Burwood, Dan Martin.